Discussion in 'Cars in General' started by GTPNewsWire, Jan 25, 2019. This article was published by Andrew Evans (@Famine) on January 25th, 2019 in the Car Reviews category. dice1998, WarriusZero, ImaRobot and 1 other person like this. My wife has one of these. I don't personally like it, but objectively it's rather good both on paper and on the road. It's also pretty reliable and surprisingly comfortable. It's also the only compact SUV we drove that didn't have a CVT in it, which was a huge win in my book. Oh, and the AWD system works really well in poor weather. My wife drives about 25 miles to work one way and in Utah, we can get a foot of snow the day after it's 60 degrees in May. Never once had my wife had an issue getting down from our side of the mountain into the flatter part of the valley for work. A couple of faults though. The tires are a weird size and cost a fortune if you need to replace them. My wife ran over a nail or something and had a blowout on the highway. It was like $270 to replace the one tire. Also, if you have a wee child that requires a stroller, most normal sized strollers in the US don't fit in the rear cargo area. As you can imagine, this was a bit of a surprise when I went to load up the stroller and spent 15 minutes play Mazda-Tetris to get it to fit. When it didn't, I said screw it and went and bought a compact stroller that fits nicely. ImaRobot and Rotorist like this. Don't know if the UK get the lower models with fabric seats, because those are the best Mazda have to offer. I had noticed they even put those seats in the Mazda3. We do, yes. They're standard on the SE and I think the SE-L. I like how the CX-3 2.0 is considered “sprightly” over there but “dangerously slow” over here (according to the Internet). Looking at the website, the CX3 starts 5,000 pounds higher than the 2? Seriously? The crossover trend is out of hand and people can’t stop buying them. The real question is, other than offer optional AWD (which will be changing very soon), have plastic cladding and offer a slightly higher sitting position, what can a CX3 do that a 3 can’t? Since you’re getting more car with a 3 for the same or lesser price (almost always less in actual transaction prices). If you’ve got a willing dealer, you can even get into a low trim 6 for the price of a loaded CX3 which isn’t even a comparison. Then you’re actually getting a usable backseat. It's more about Mazda going upscale. Offer it and they will come. The CX-3 looks more upscale than a 2. The base model prices pick up where the 2 leaves off. Can't compare the pricing. Look at the cars. The CX-3 fits that small urban runabout. It's not about hauling big items. Leave that for the CX-5, 6 wagon and CX-9. It's slightly taller than a Mazda3, but shorter. It sells because of its compactness. Also looks the part. I'm not blind to the pricing. It's really not trying to be anything more than a well equipped, well dressed, hatchback companion. It’s true it’s far more upscale than a 2 (not that I’ve sat in one since they don’t sell them here except as a Toyota) but that just shows the amount of profit being made. I can’t disagree with you on the other points, since subcompact crossovers make a lot more sense in Europe and elsewhere where space is at a premium and they’re the easiest way to get the easier entry and exit and raised position of a crossover. Compared to North America (where a lot of people still buy the biggest vehicle they can afford) where they’re mostly all considered a punchline with a few exceptions (Kona, Renegade, Encore) yet they still sell anyway. While my 2 has different sized tyres to the CX3 it has the same problem, Tall thin tyres are expensive because no one has them it was going to cost me over $200 a Tyre just for cheap Chinese ones and nearly $300 if I wanted Yokahamas the cheapest branded tyres available. What you got to do is go an extra Inch wider to the limit of your Rim and the price goes down significantly, doing that halved the price per Tyre for me. Rotorist and Joey D like this. The CX-3 actually loses a bit of rear shoulder and leg space to the 2 in gaining its massive amounts of extra boot space and just under half of the 4cm (1.6in) increased overall height of the CX-3 is actually attributed to the ride height. In fact the difference is even less for our models, weirdly - unladen ground clearance for the 2 is 152mm compared to 160mm for the CX-3. The higher seating position is also a farce, since the 2 and the CX-3 share almost everything in the interior right down to the mounting points and amount of movement in the front seats - so you have at most a 1.7cm difference in seating height; if you can discern that difference then power to you but I certainly can't. While I don't usually subscribe to the "driving a slow car fast is more fun" theory I do actually have more fun throwing the 2 about since the back end feels a little more frisky. The real deal breaker though is that in our market the basic Neo Sport CX-3 is the same price as a loaded GT 2, and trim-for-trim the CX-3 matches the considerably bigger and arguably more accomplished 3. Nexus, mustafur, 05XR8 and 1 other person like this. My Genki 2 which was the top trim when I got it was 3k cheaper then the CX-3 Neo at the time, it makes no sense when you look at the equipment between the two. The 2 has a pretty high ride height as it is for a non SUV anyway, (not that I think that's a good thing). I was amazed at how expensive the CX-3 was when I bought my Mazda in late 2016. I wound up leasing a base model Mazda 6 which was a shade under $23k at the time. They had a fully optioned CX-3 that was over $30k and I couldn't believe it. Makes sense though a Mazda 3 is more expensive then a base 6 with it fully optioned as well. Not that it's worth it. I'm sure this isn't the case, but the 6 seemed twice as wide and twice as long as the CX-3. Granted, I never sat in or drove the CX-3 because I wasn't looking for a crossover, but that is how it felt in the showroom and driving by them on the lot. I could see the CX-5 (not sure if that's available in Europe) topping $30k but the CX-3 was just so small. 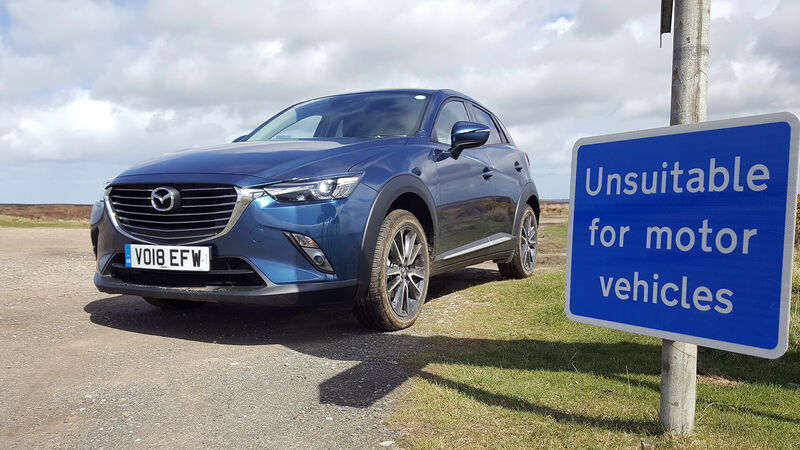 The current price difference between the car I tested and a base Mazda 6 is £400... in the CX-3's favour. However, Mazda has changed the CX-3 (and 6), so it's now £600 cheaper to get the 6. You're looking at different markets. The CX-3 is a small hatchback, stuffed with toys and gadgets (and a very useful AWD system in this case) and pitched as a second car for those with young families, racking up 50 miles a week between supermarkets, coffee shops and school. The 6 is a medium saloon, pitched as a main or only car for someone who drives a long way in a straight, uncongested line listening to Radio 2 on DAB, commuting 300 miles a week or more. Spec them out equivalently and the 6 is £7k more expensive. Looking at other brands, the nearest equivalent Ford EcoSport (ST-Line; 125PS, 4WD, but diesel) is £1,000 more than the CX-3, and £5,000 more than the base Mondeo (Zetec; 125PS petrol, compared to the 145PS petrol 6). The nearest equivalent VW T-ROC (R-Line; 150PS, 4WD, petrol with 6-speed manual) is £3,400 more than the CX-3 and £2,000 more than the Passat (S; 150PS, petrol, 6-speed manual). For Hyundai the Kona (Premium GT; 177PS, 4WD, 7-speed auto) is £2k more than the CX-3, and £4k more than the i40 (S, 141PS, diesel, 6-speed manual). It's not exactly unusual for the top-of-the-range B-segment crossover to be 15% more expensive than the bottom-of-the-range D-segment saloon from the same brand. The metal isn't the expensive part of the car. 88GTA and mustafur like this. All good points, although the 6 has more power than the CX-3 over here and my 2016 came standard with a back-up camera. The only option on the CX-3 is the 2.0-liter four-cylinder engine (148 horsepower, 146 pound-feet of torque) while the 6 has a 2.5L with 184 horsepower and 185 pound-feet of torque. My takeaway from your post and my time at the Mazda showroom is that crossovers are overpriced. I saw both cars, in the metal, and I'd take the base 6 every day of the week. It does make sense that a top spec crossover will set you back more than a base level sedan, but I personally couldn't choose a crossover for myself. I can't see the value in that, especially in this specific case. I'd say it'd be much easier to get a cheap deal on an Astina, or any 3 for that matter, compared to the recently-facelifted 6. The new 3 is due to hit in a couple months. Then again though with how much stuff they've managed to pack into the base 6 I'd agree it's not worth getting an Astina. Yeah nah, the 6 has all of this as standard as well. In fact like the top CX-3 it has the Advanced SCBS (high- and low-speed AEB, MRCC radar cruise) and front and rear parking sensors with reversing camera, however unlike the CX-3 it has the proper HUD rather than a piece of perspex that rises out of the instrument binnacle, dual-zone rather than single zone climate control etc. etc. The CX-3 does have the advanced keyless entry though as well as the BOSE system and of course leather. In the USA, the current CX-3 only gets the automatic too - and that's a grand right there. By the looks of it, the 2019 CX-3 in the same powertrain (but auto) is $27,145 for the top grade model, while the base "S" 6 saloon is a 184hp 2.5 petrol manual at $21,495 - the auto is $1,500 more, for about $4,200 difference. The CX-3's Hyundai equivalent would be the Kona SEL at $25,840 (same power, auto, AWD), although you'd have to tick a few options to get it to the same spec, next to the Sonata SE at $22,050, for about a $3,800 difference. It just doesn't seem to be the case that the Mazda top-spec B-CUV is way more expensive than the base D, but that they all are - and it pretty much comes down to equipment. That aside, it's something of a false economy anyway - I don't reckon more than 15% of Mazda CX-3 customers will pick up the top-spec car because the AWD makes it more expensive and thirsty, and it's not something you pick unless you have an outright need for it, so they'll aim for an SE-L. For that matter, 85% of 6 customers won't buy the base SE either, they'll go for an SE-L Nav as a minimum (and, over here, the diesel auto). If we look at the cars people actually buy, the CX-3 is £21,395 (£22,695 if they go for the Sport Nav) and the 6 Saloon is £27,595. SE-L Nav+ is the base grade 6 as of the facelift. So...more like 100% won't buy the SE.